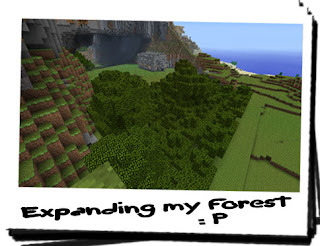 Diary of a Miner: Day 16: Today I grew a forest in 20 minutes! I got up early today, but this was because I had plans! I had grand plans to dramatically expand my forest, making use of the saplings I had harvested from the trees, and the bone dust I acquired by grinding down bones from animals I've killed for food. I filled my bag with saplings and the bone dust, placed into a separate pouch, and took a shovel with me. On the way out I picked up my bow and quiver. I took it everywhere now. I took the same journey to the flat field near to the forge and the water trap, making sure not to fall off. I really need to make a fence for the edge of this walkway. As I got closer to the forge, I noticed something green floating in the water of the trap from a distance. Placing my bag onto the ground and taking my bow in hand, I readied an arrow and inched closer. I lowered my bow... it was a branch with some leaves sticking out of the end... I was relieved and annoyed at the same time... I really thought I'd trapped something this time. I retrieved my bag and got to work, planting saplings 5 metres from each other and applied the bone dust to each sapling individually. As I went onto planting the next sapling, the previous one had already matured, and would provide me with plenty of wood! Within 20 minutes or so, I had made a decent sized copse of trees. After finishing up with the rest of the planting, I decided that it would be best to finish off the forge; my dedication to finishing things really takes a punch every now and again. 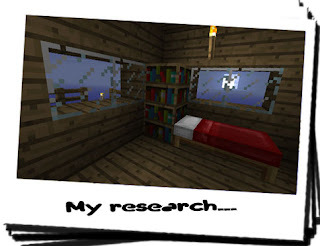 I didn't know how regular the weather was here in Minecraftia but the last thing I wanted was collections of water pooling into the forge. I created a small wooden ladder to get onto the upper most walls, and began cementing cobblestone blocks into place. Once I had the height of the wall as needed, I returned to the upper floor and erected a simple wooden walkway across the top of the upper wall. This would help me to complete the forge whilst the cement dried, and stop me from plummeting into the lava below. Within a few hours I had a simple flat roof complete, which I added to by creating ridges from stone blocks on top. This would prevent water pooling on the top of the roof, and possibly causing cracks and leaks. Happy with the work, I returned to the house with my inventory considerably lighter! After a few mintues of deliberating the pros and cons, I descended into the hole, making use of some stone I had collected. I then had to return to the entrance of the shaft to construct a few wooden steps to ensure I could get down further. Returning to the mysterious hole, I placed the wooden steps down near the stone blocks and nailed them into place. It was then that it occurred to me that I could here running water. 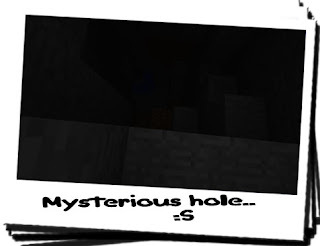 After finding my torches in my bag, I was able to illuminate the small hole and found an underground source of water! Unexpected, but not unwanted, I was able to force the tide of the water back to a small pool, and began to explore further into the hole. It wasn't very big... It had a large amount of gravel and hard stone, but something else: redstone! I already had masses of the stuff, but more wasn't a bad thing. 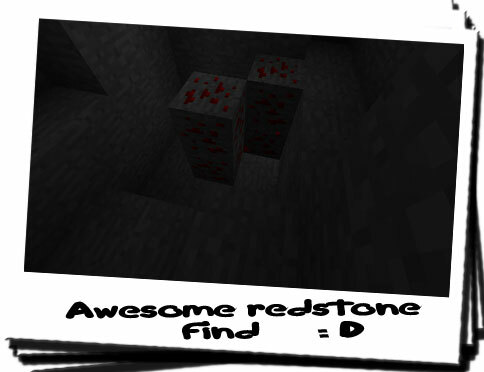 I excavated it and found that a vein of coal resided behind the redstone! If that wasn't enough, behind the vein of coal was a huge desposit of iron! It was like a nice ore sandwich; there just seemed to be loads of it! I was half expecting to find gold behind the iron, and then diamond behind that... But alas no. After the iron, there was only more gravel and hard stone. Returning to the entrance of the shaft, I sent my finds up to the surface on the chest cart, being pushed by the steam cart. I wanted to take one more look around the shaft before returning to the surface. I spent another hour down there before returning to the surface, and, looking outside, I realised how late it was! I really needed a way to tell the time when underground! That is another reason why an open-cast mine would be so much more effective; no need for torches because the light from the sun illuminates everything, no need to have wooden steps as frequently because I can create my own from the stone, and after I'm finished with it, I could pump water into it to turn it into a lake! The only downside with an open-cast mine is the need for large amounts of TNT! Which I don't have... yet!